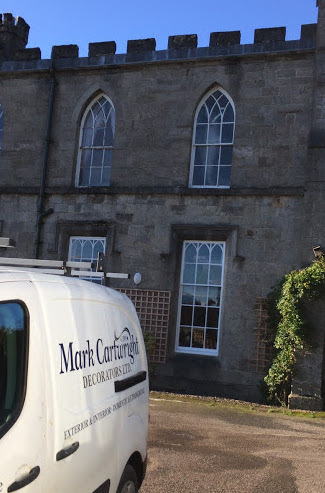 Higham Hall | Decorators in! Higham Musings / Decorators in! Our decorator was suddenly available this week, so we have put them to work on Bedrooms 6 and 19. If you look closely in the top right window, you can see one of the decorators hard at work on the interior of the arched window in Room 6. As ever, we have chosen heritage shades, in Room 6, taking the colour from the William Morris feature wallpaper to harmonise. Images to follow in a future post. Room 19 does not have any gothic features and is in the wing above the Cedar Room. We have carefully chosen shades to complement each other and we’re working on getting a William Morris blind sorted (like we did in Room 25). Luckily, we have been able to shuffle rooms around and we are not too full this week. Being able to get things like this done and to continue running is one of the key things about Higham. But also, our decorators are so popular, we often have to wait a long while before they can put a team onto our projects. But it is worth it in the end. This decorating company, incidentally, were orignally responsible about 18 years ago for the tasteful decoration of some of the public areas of the building. Their work then held out well, so was are glad to continue Higham’s relationship with them. Seriously, though, being able to employ local talent to carry out important jobs for us is one of the privileges of being a successful places such as Higham. In return, we find that those specialists we use are prepared to work with us to get things done properly and in keeping with the historic building and the kind of place Higham is. Also on the cards for painting very shortly are the Dining Room and the top outside front windows – and those will be another story!